Amanda Kristin Nichols, Dan Fenaughty, Scott T. Hinson, Sara Carolynn Kennedy, Stephanie Turci, Chauncy Thomas, Alexandra Kopko. Sag Harbor, NY - November 6, 2018 - Bay Street Theater & Sag Harbor Center for the Arts is pleased to present this year’s Literature Live! 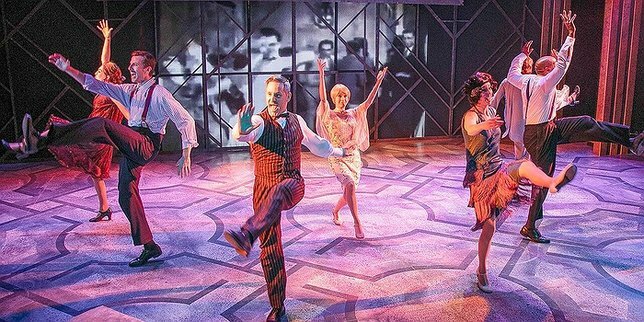 production of F. Scott Fitzgerald’s The Great Gatsby, adapted for the stage by Simon Levy, directed by Joe Minutillo and choreographed by Stephanie Vertichio. This is the tenth year of the Literature Live! program. Public performances are Thursday through Saturday, November 8 – 10, 15 – 17, and Thanksgiving weekend Friday- Sunday, November 23 - 25. Tickets are on sale now and available online at baystreet.org, or by calling the Box Office at 631-725-9500. F. Scott Fitzgerald’s classic Jazz Age novel, The Great Gatsby, comes to life on Bay Street’s intimate stage. The Roaring 20’s was a time of excess, lavish parties and speakeasies. Jay Gatsby was a secretive and successful kingpin of the elite party circuit, but he had one burning desire and one purpose - to be with Daisy Buchanan, the love of his life from his youth. Set on Long Island in 1922, this compelling drama portrays the human condition of ambition, love, lust, greed, deceit, and most of all the struggles of class and the American Dream. Literature Live! is a BOCES-approved Arts-in-Education program. Plays chosen are from the standards-based literature and are supported with teacher-developed lesson plans and reference materials. All performances are 90 minutes and weekday shows are followed by a question and answer session. Bay Street Theater is committed to supporting students who have little or no access to the performing arts in schools. Now in its 10th season, the program has successfully served over 60 schools and nearly 12,000 students and their educators. The production is performed free for student groups and their teachers from across Long Island. Literature Live! is currently being supported by a Matching Grant of $100,000, with $35,000 currently raised to date. School groups can reserve free tickets for their group by contacting mary@baystreet.org. Literature Live! is sponsored by Century Arts Foundation which is the lead sponsor for the Literature Live! Matching Grant Challenge, The Bay Street Board of Trustees, The Andrew Sabin Family Foundation, Susan Dusenberry, Dana Foundation, In Memory of Sloane Shelton, Irvin Stern Foundation, Mary Lou & Sal Ranieri, Nancy Stearns, Town of Southampton, and BTIG, LLC. The Box Office is currently open Tuesday - Saturday 11 am - 5 pm. To purchase tickets, call the Box Office at 631-725-9500 or order online at baystreet.org. Bay Street Theater & Sag Harbor Center for the Arts is a year-round, not-for-profit professional theater and community cultural center which endeavors to innovate, educate, and entertain a diverse community through the practice of the performing arts. It serves as a social and cultural gathering place, an educational resource, and a home for a community of artists. Subject: LongIsland.com - Your Name sent you Article details of "Bay Street Theater’s Production Of F. Scott Fitzgerald’s "The Great Gatsby" Through November 25"